This painting from a manuscript of Khusraw and Shirin by the poet Hatifi demonstrates the importance of Persian literature in the Ottoman world. The manuscript contains seven paintings, executed in a distinctive style related to western Iranian tradition from the Aq Quyunlu but also borrowing elements from European sources. 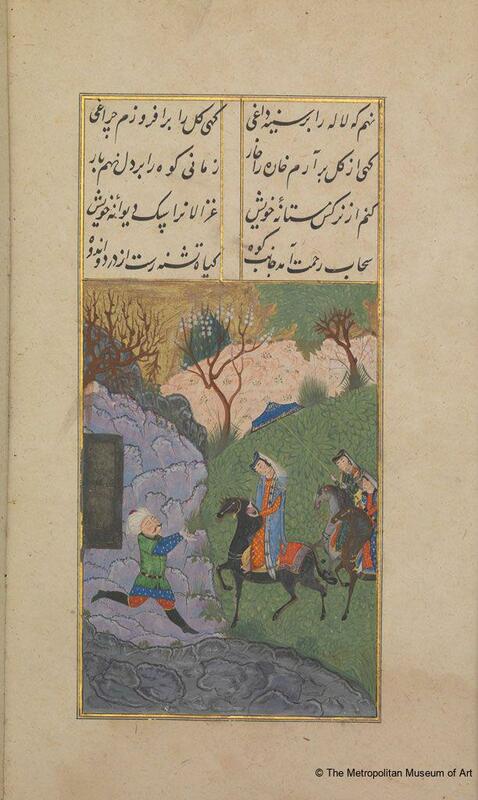 This scene depicts Khusraw riding on his horse Shabdiz while hunting. A poem on the final page of the manuscript identifies the sole artist of the work, who completed the calligraphy, illumination, gilding, and painting, as Suzi (“the burning one”). Atil, Esin (ed), Turkish Art, Washington D.C/New York: Smithsonian Institution Press, 1980: 161, ill. fig. 71 (b/w), fol. 22b. Brend, Barbara, Perspectives on Persian Painting. Illustrations to Amir Khusrau's Khamsa, New York: Routledge Curzon, 2003: 153. Ekhtiar, Maryam, Canby, Shelia R., Haidar, Navina and Soucek, Priscilla P. (eds), Masterpieces from the Department of Islamic Art in The Metropolitan Museum of Art, New York: The Metropolitan Museum of Art, 2011: 288–89, no. 200, ill. 289 (colour). Ettinghausen, Richard, "Reports of the Departments: Islamic Art", Metropolitan Museum of Art Bulletin, 28/ 2 (1969): 79-81, ill. 79 (b/w), folio 22r. Grube, Ernst J., Studies in Islamic Painting, London: Pindar Press, 1995: 460, ill. fig. 11 (b/w). Petsopoulos, Yanni (ed), Tulips, Arabesques & Turbans. Decorative Arts from the Ottoman Empire, New York: Abbeville Press, 1982: no. 195, 199, ill. pl. 195 (colour), folio 22r. Swietochowski, Marie and Jenkins-Madina, Marilyn, Notable Acquisitions 1965–1975, New York: The Metropolitan Museum of Art, 1975: 133, ill. (b/w). Swietochowski, Marie and Ettinghausen, Richard, "Islamic Painting", Metropolitan Museum of Art Bulletin, New Series, 36/ 2 (Autumn 1978): 46–47, ill. 46–47 (colour), folios 15r and 22r. Welch, Stuart Cary, The Islamic World. Vol. 11, New York: The Metropolitan Museum of Art, 1987: 117, ill. fig. 87 (colour). Yoltar-Yildirim, Aysin and Brill, Robert H., "A 1498–99 Khusraw va Shirin: Turning the Pages of an Ottoman Illustrated Manuscript", Muqarnas, 22 (2005): 96–109, ill. figs. 1–12, folio 1v fig. 4; 2r fig. 5; 2v fig. 6; 15v fig. 8; 22v fig. 9; 32r fig. 10; 49v fig. 11; 67v fig. 12; 78r fig 7 (colour).